Our first episode! 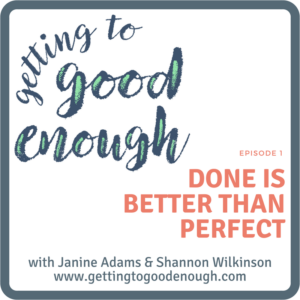 Shannon and Janine talk about a basic tenet of embracing good enough: the idea that done is better than perfect. 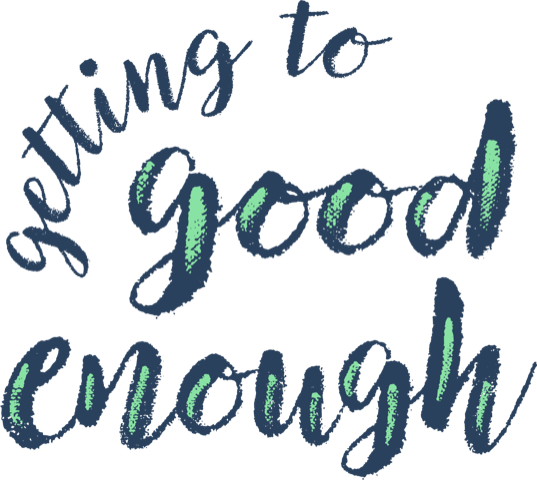 We talk about how getting started and finishing something–even if the result is less than perfect–is so much better than waiting for perfect to come along. • How perfectionism can keep you from getting started on a project. • How being willing to make mistakes makes getting to good enough possible. • Strategies for letting go of perfectionism and easing into good enough. Great podcast, ladies, and I’m so not surprised to hear that Bix is already making cameo appearances (or at least getting mentions). Mazel tov on the new show, and I’m looking forward to working my way through all of the other casts. Thank you, Julie! If you have ideas for topics please don’t hesitate to tell us. Thanks so much for your support! I enjoyed listening to your first podcast. I plan on listening to the others over the coming month, hopefully one per day. I would love to see a clickable Table of Contents that would get me to the podcast so I can listen to them in order without having to do so much clicking and scrolling through the “Older Posts” sections. Christy, so glad you enjoyed the first episode! A page like you’re requesting is on our to do list. We’ll try to bump it up to make it easier for you and others to access the older podcasts on the website. Thanks for commenting!